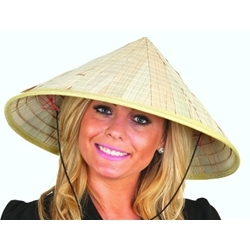 The Bamboo Coolie Hat comes as pictured. Also known as a Conical Rat, Rice Hat, or Farmer’s Hat, the Coolie Hat is a recognizable look tracing its roots to East, South, and Southeast Asian countries. Great for a costume or for some shade from the sun.